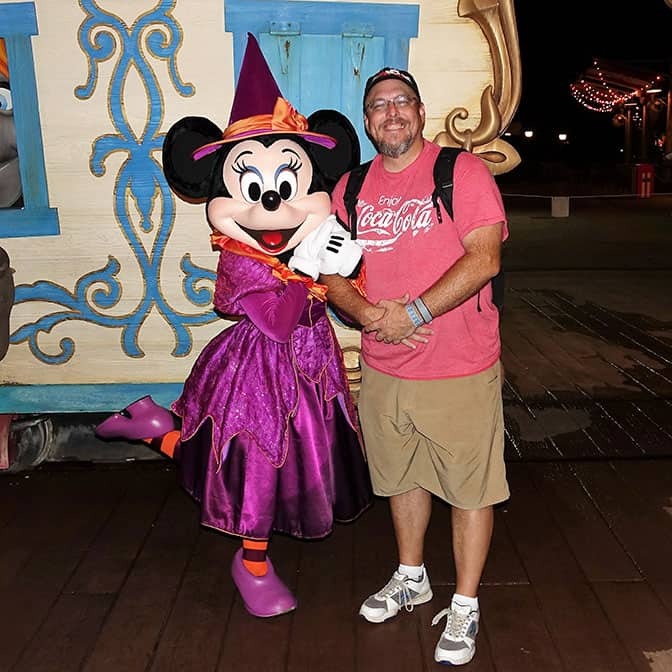 At the September 11, 2016 Mickey’s Not So Scary Halloween Party I set out to do something I hadn’t tried before. 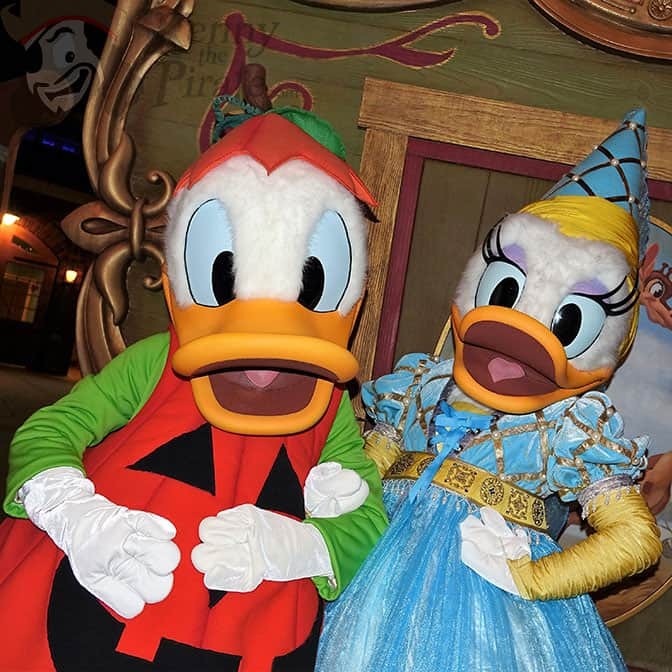 I wanted to meet every unique character and character in a special costume at the party. 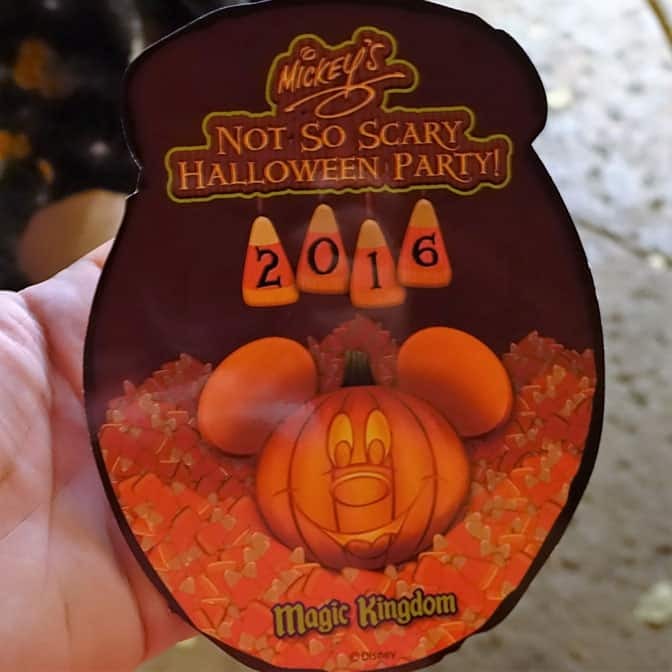 Here’s how I did and some news for those planning to attend a party! 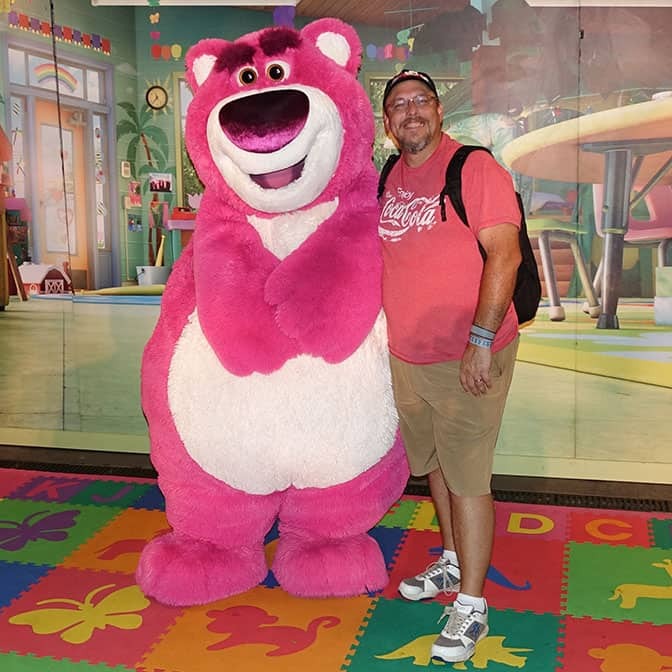 I wanted to see if was possible to accomplish my goal of meeting every character and creating a new plan for Character Locator subscribers that would allow them to follow the plan to meet characters. There’s a lot of great detail on there and many terrific plans already, but hey, I can always create another fun one! 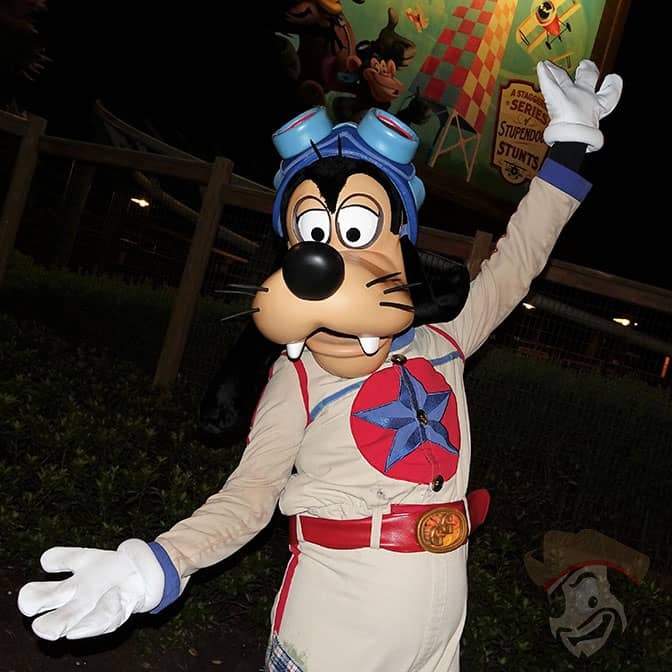 Most of my plans on Character Locator include viewing the fireworks, parade and special shows and such because they are a major portion of the party’s unique feel. But what about the character crazed fan who just wants to meet as many as possible? I arrived a little later than I wanted as I parked at the TTC at 3:45pm, when I could have been entering the party then. I boarded the monorail at 4:00pm and I was in the park at 4:10pm. 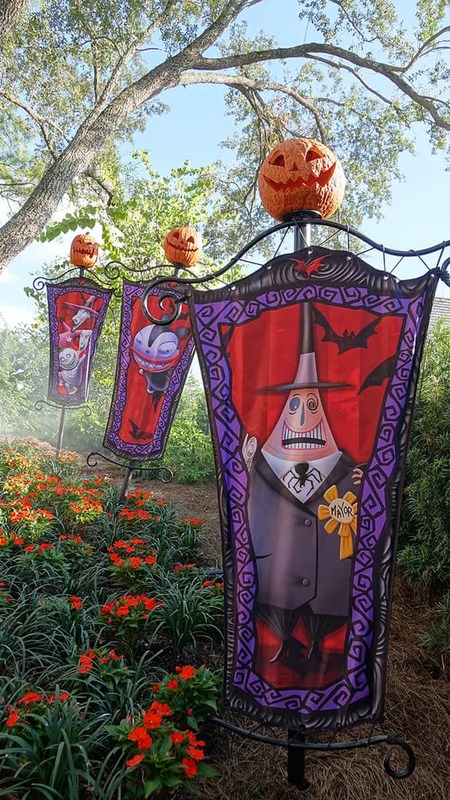 This year they aren’t handing out candy bags as you enter, so you have to go to Jungle Cruise, Buzz Lightyear or Philharmagic to pick them up. 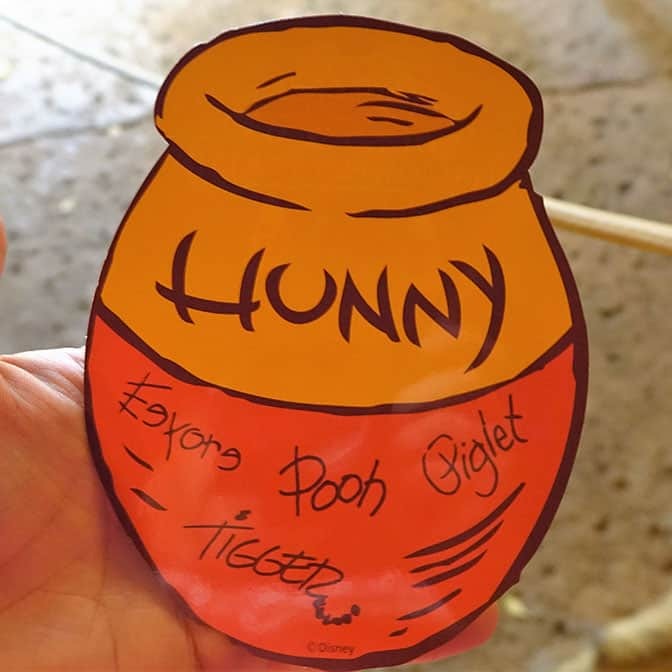 The Cast Member was distributing the Sorcerer’s of the Magic Kingdom card as you enter. Here’s the characters I met and don’t forget you get the detailed plan with times and what order and such with your Character Locator subscription! 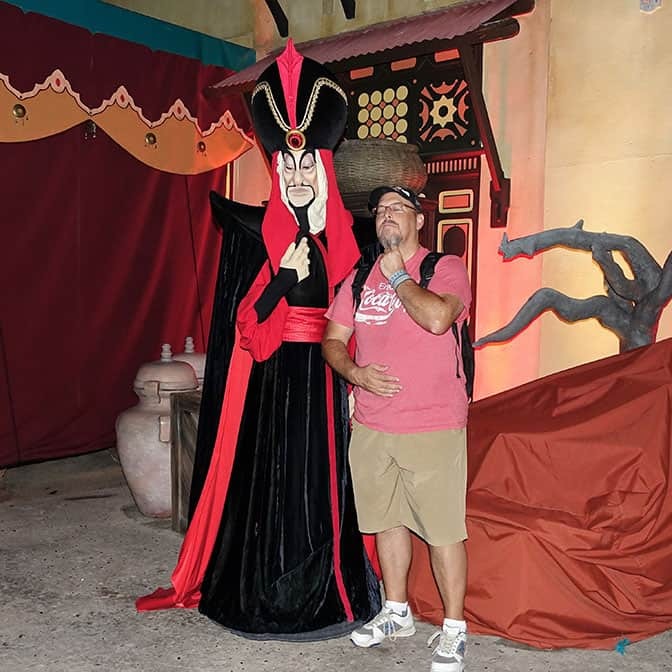 It’s called the “KtP’s Extreme Halloween Party Plan” If none of the formatted plans help you find the exact options you want, you can submit a request for me to create a Custom Plan on Character Locator as well now! 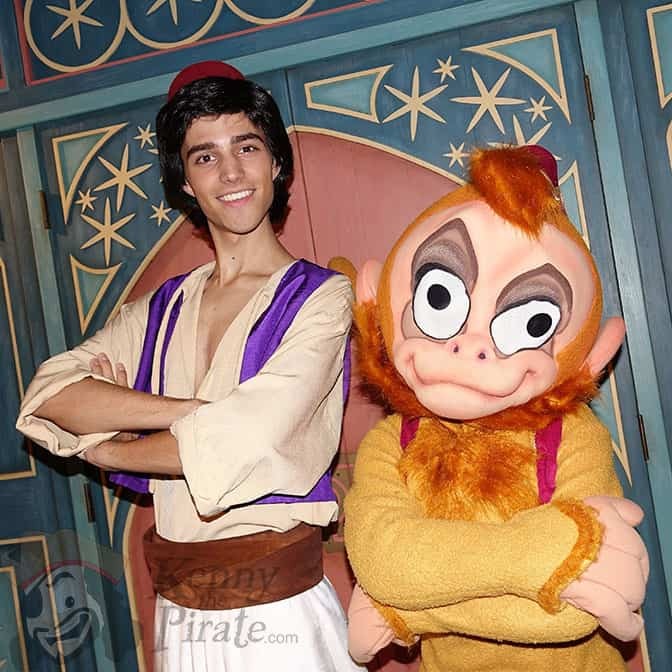 Aladdin continues to meet in his “Street Rat” costume at the party. 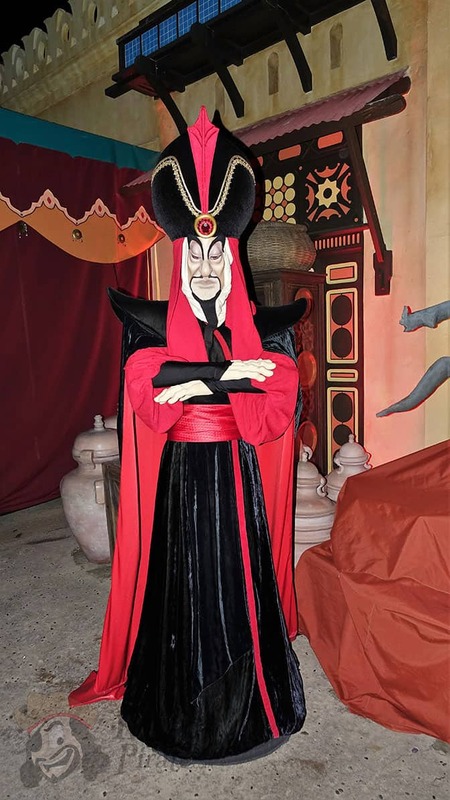 He has changed to his “Prince” costume at Epcot, but not here for the parties. Abu was fascinated with my gold ring, but couldn’t easily remove it from my fat finger. I was incognito, but many wonderful readers greeted me at the party and we took a few selfies together. 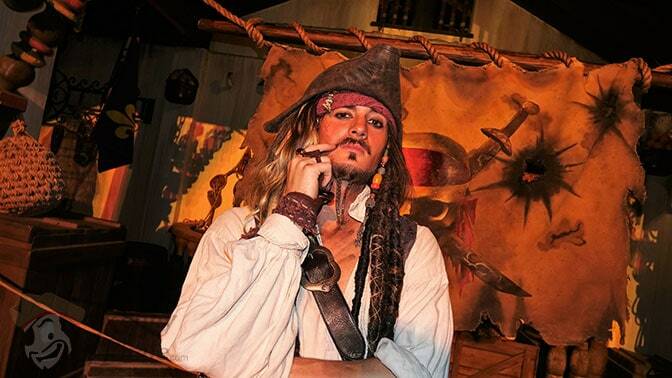 It’s “Captain” Jack! 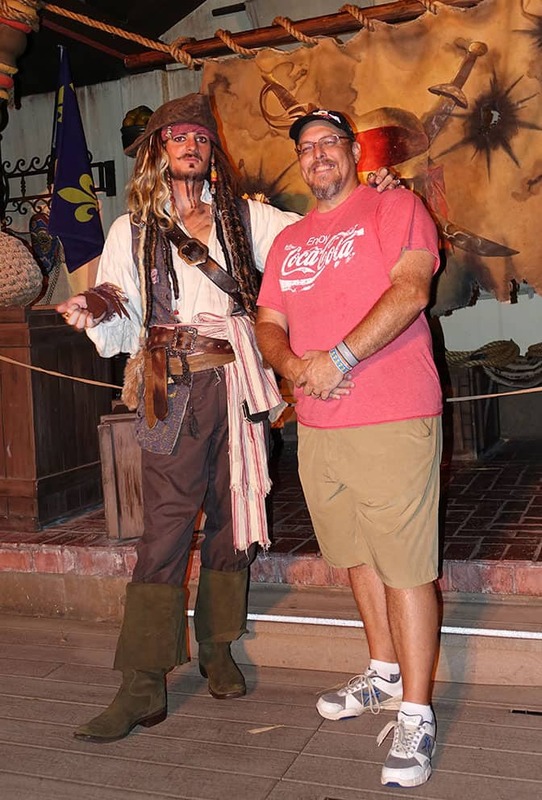 We discussed what type of ship I use for pirating and how I have 3 extra deck hands at home. He said he’d take the boy as Elizabeth caused him a great deal of distress in the past. 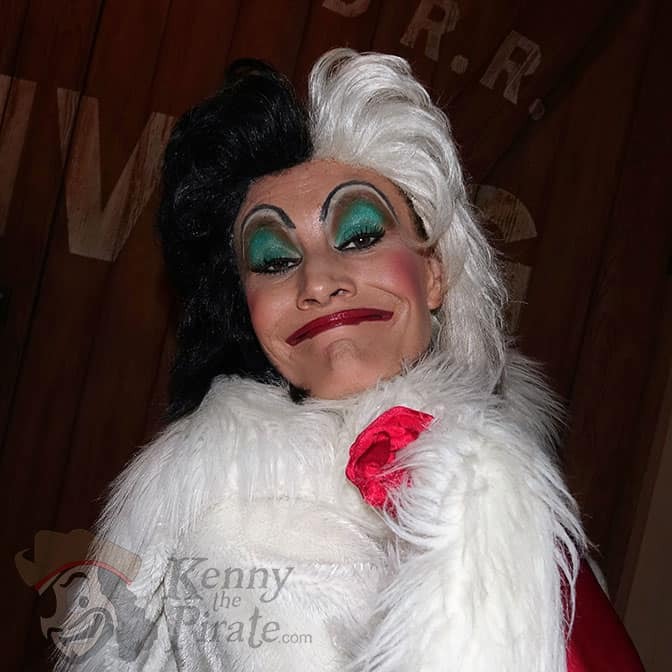 Cruella is always a lot of fun. Some see her as villanous, but she seemed super nice to me. She does enjoy having her photo taken and discussing what type of puppy one owns. I’m safe as we have a Bichopoo. 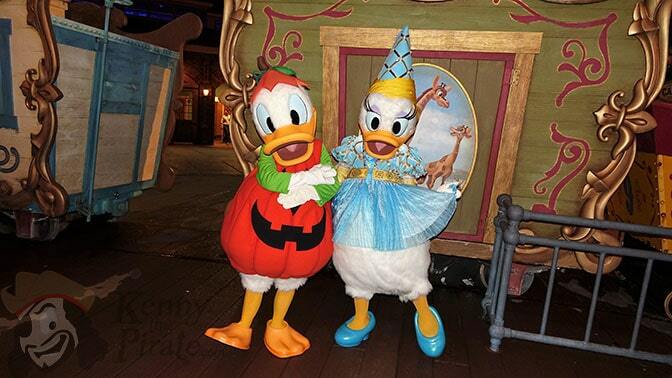 Donald and Daisy are in the same queue line as Minnie Mouse, but take a separate photo than Minnie. Donald was really hyped up this evening. He must have been snagging some candy from the trick or treaters. He is always fun. Daisy was especially sassy and had to put him in his place. They have some awesome costumes, right? They are quite a tough meet and greet though. They are really popular and only appear at specific times, so you have to line up early or you’ll miss the cut. Instead of signing autographs, they hand out these special collectible cards that you could add to your memory book. I wish all the characters at the party would do this. It keeps the line moving and allows the guest more little treats for their bags. Neither of these characters are special in terms of being unique or special costuming, but I wanted to meet them so I could get a couple of nice photos of them together. 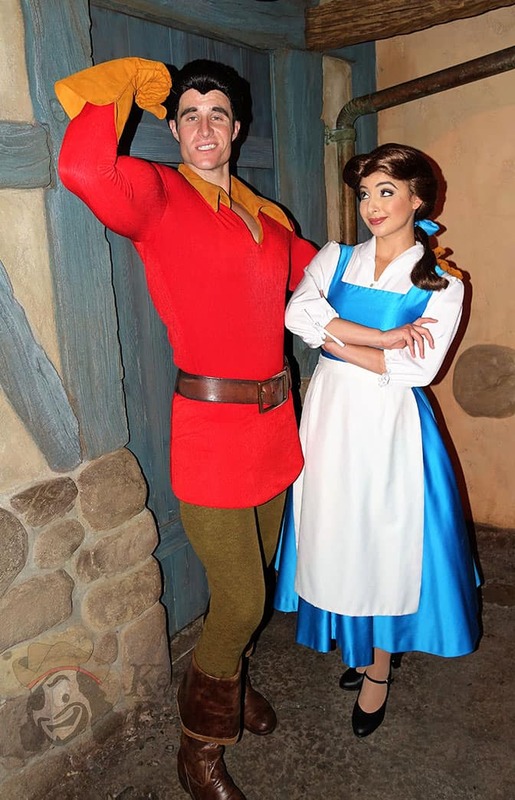 We never see them together at Walt Disney World, except on stage. 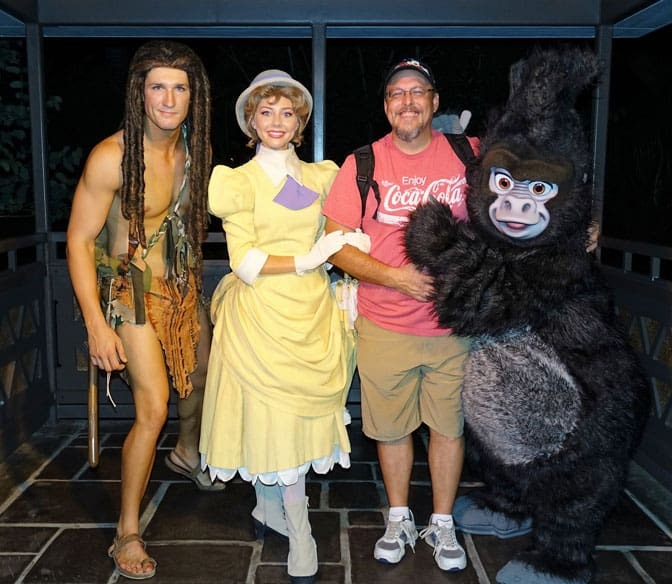 One of the benefits of using Character Locator is the ability to view the full schedules 24 hours a day 7 days a week, so you’d know how late they stay out to meet guests. It was sooo humid that my ears were sweating. 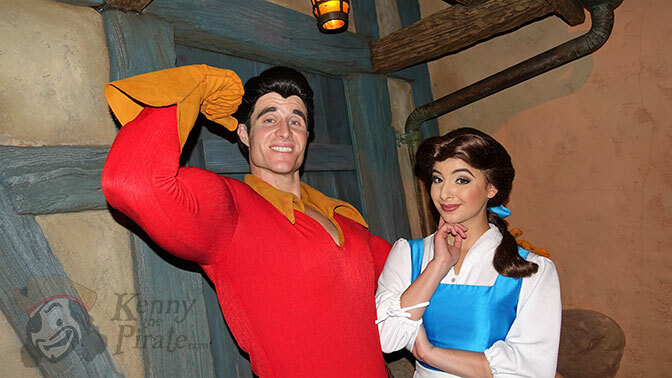 I feel sorry for Belle having to be so kind to me with sweat dripping off my arm. She is always so nice. 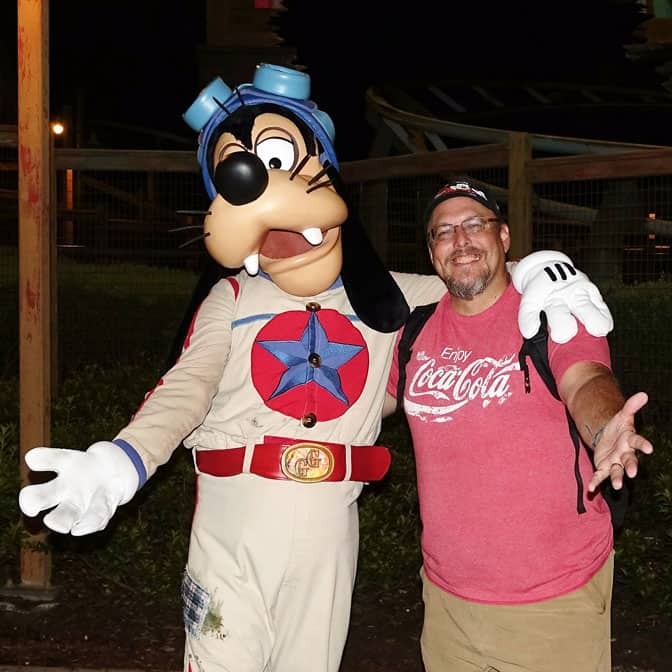 Goofy isn’t unique. 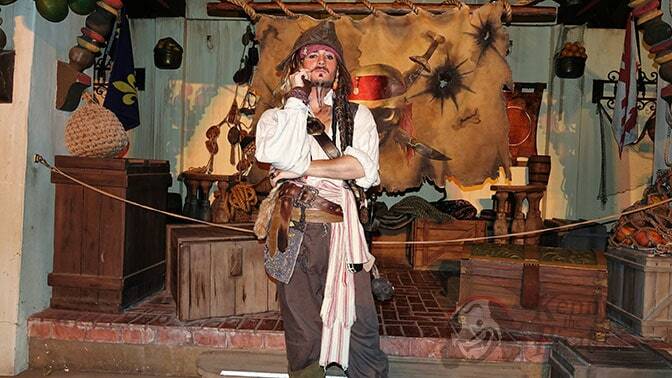 He wears this costume daily at Magic Kingdom. 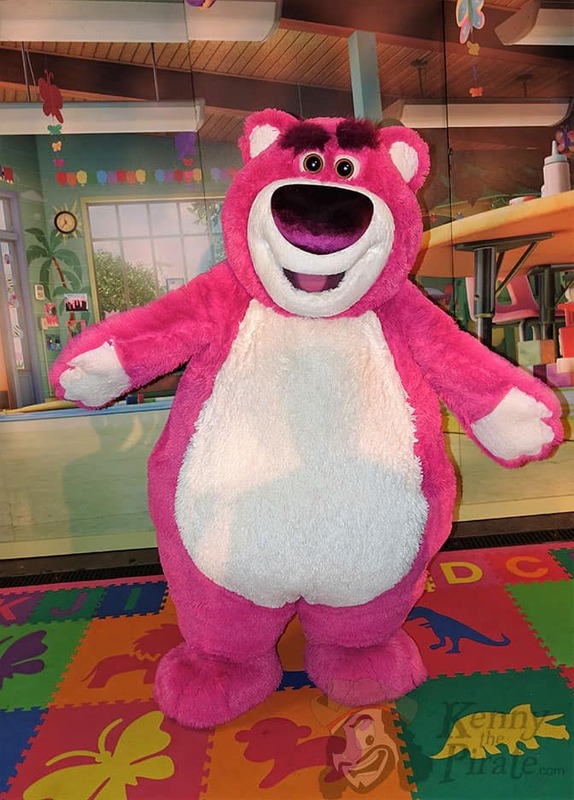 I just stopped to meet him because he is my favorite character growing up and there was no line. I was told that mimicing the character brings symetry to the photo. 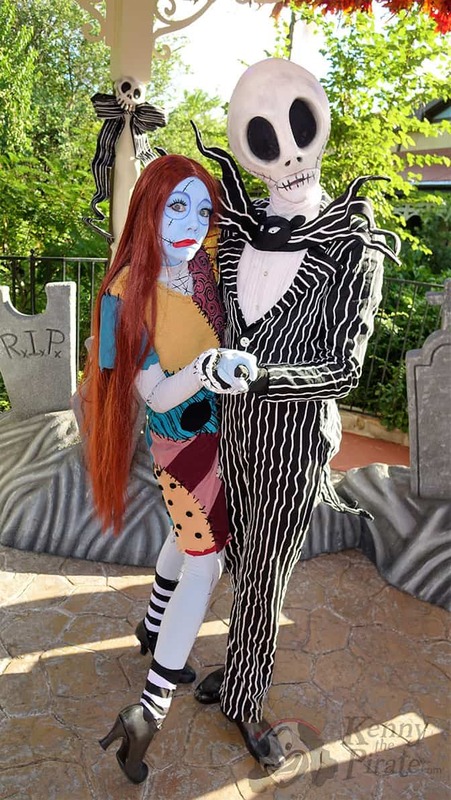 Jack and Sally are so popular at EVERY party that their line is often cut off early. On this night, the line had been cut by 10pm at least, it may have been earlier. Follow my tips on Character Locator and you’ll be way ahead of the game! They also do not sign autographs to keep the line moving and offer you this special card with their forever dying love. 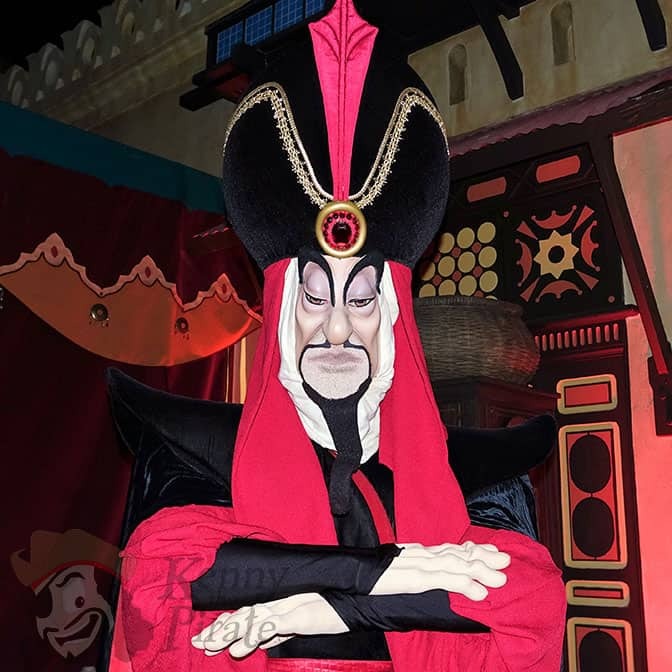 Jafar and I always compare goatees. I grew mine out a little longer for the meet. Maybe I’ll keep letting it grow and visit him for one of the last parties. I might need to dye mine though. It’s making me look old these days. 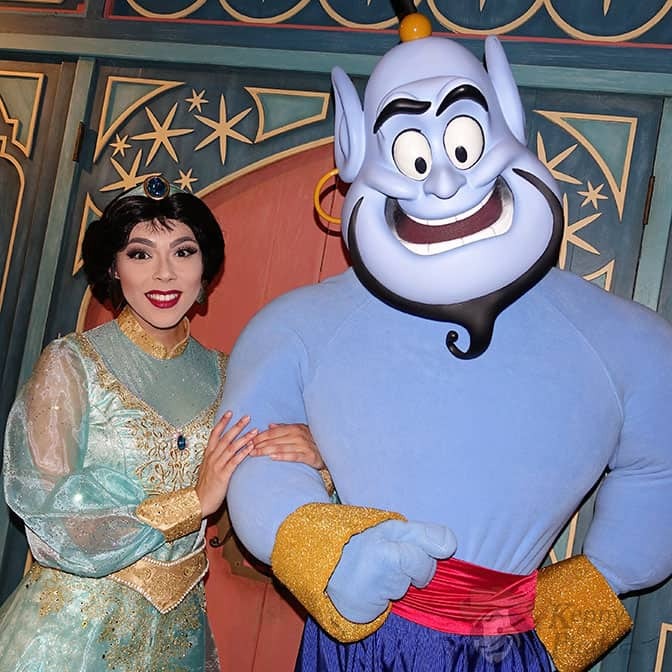 Jasmine continues to wear her new dress at all meet and greets in Disney World. I kind of feel sorry for her because the new dress wasn’t received well and photos of it with complaints are all over the interwebs these days. She is a gracious person and a pleasure to meet. 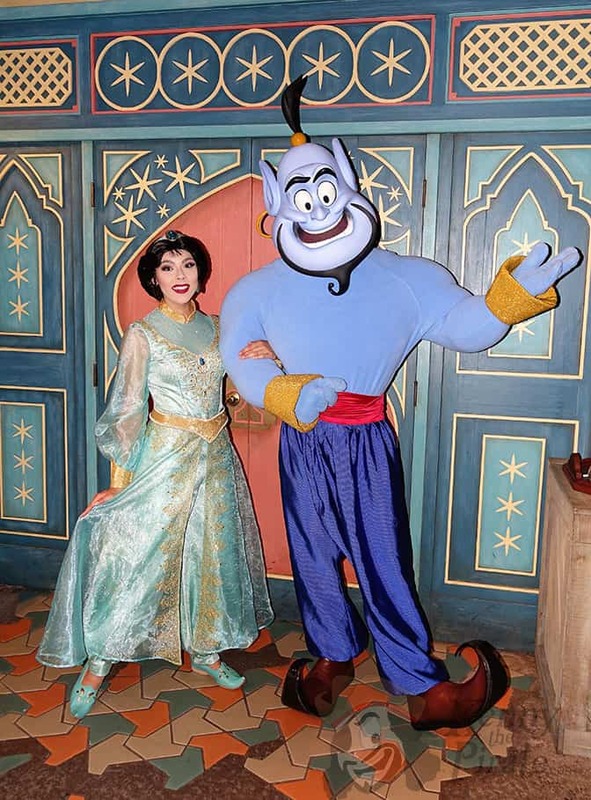 And you get Genie too! How can a villain be so cute and cuddly? I wanted to see if he still smelled like strawberry, but with all the human sweat from the hugs, it was hard to discern. Can you think of another villain you’d cuddle with while he plots your overthrow? When I met him, he was still chatting away, but others said he had moments where he wasn’t as talkative. 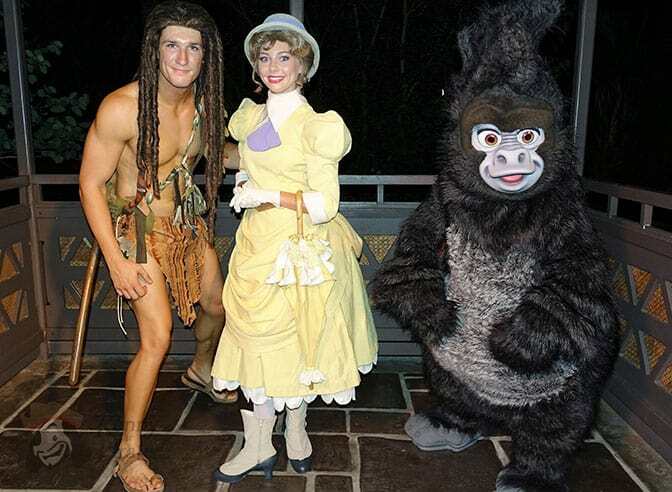 He changes to this costume at 7pm promptly and you must be wearing your party bracelet to meet him this way. Before 7pm he wears his tuxedo. She shares a queue with Donald and Daisy, but has her own photo spot. 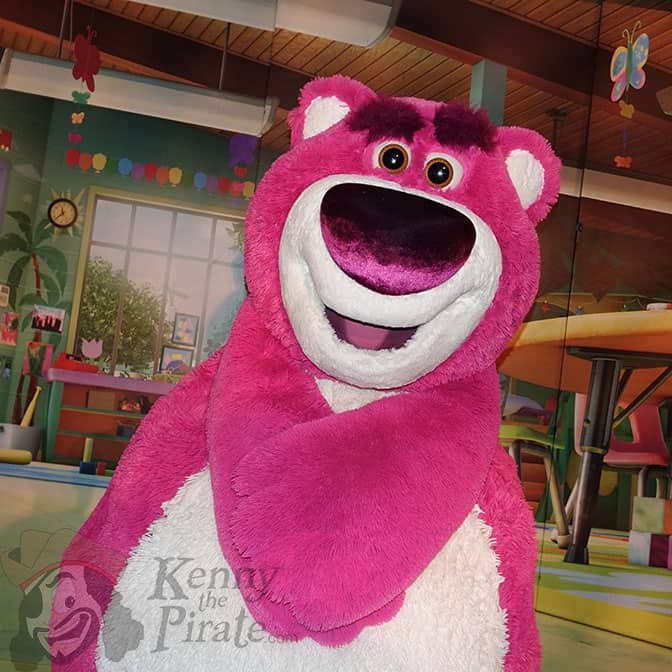 If you are wondering if a character autographs or offers photopass, those details along with interaction tips are on Character Locator too! 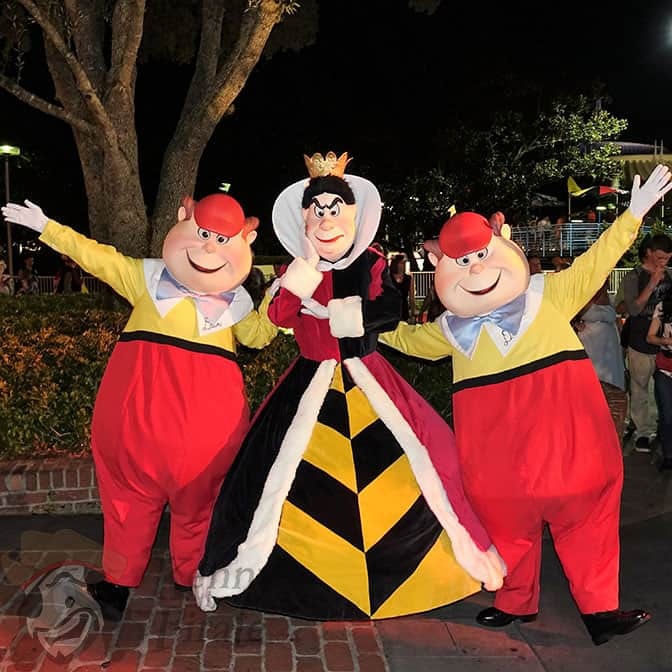 On this evening the Queen of Hearts was only appearing for 30 minutes on and 30 minutes off. She is supposed to appear the entire time the Tweedles are out, but things do happen some times. The Cast Member was nearing the cut to bring her back from croquet and asked who wished to wait for her. The line went from maybe 6 families for Tweedles alone to a solid 30 minutes very quickly. Why can’t we return to a few years ago and make all the villains available? Post signs that tell people how long the wait will be and don’t listen to those who whine about it. I’d wait 4 hours for a special character, if need be. This thought will likely not be very popular, but it’s my thought, so I’ll share it. 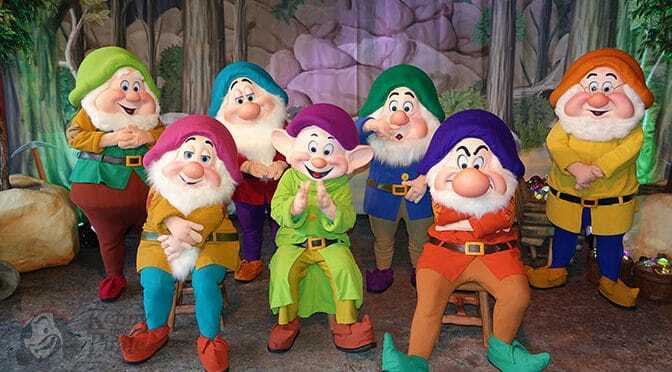 Why don’t we make the Dwarfs Christmas Party exclusive and add 7 villians instead??? 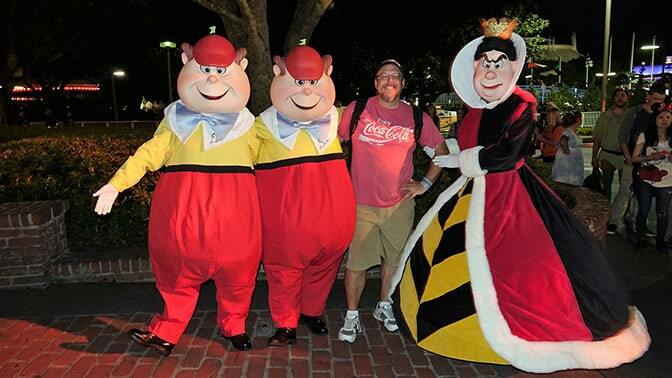 The Dwarfs are a nice photo opportunity, but there’s not much interaction. They don’t offer autographs or a special card. 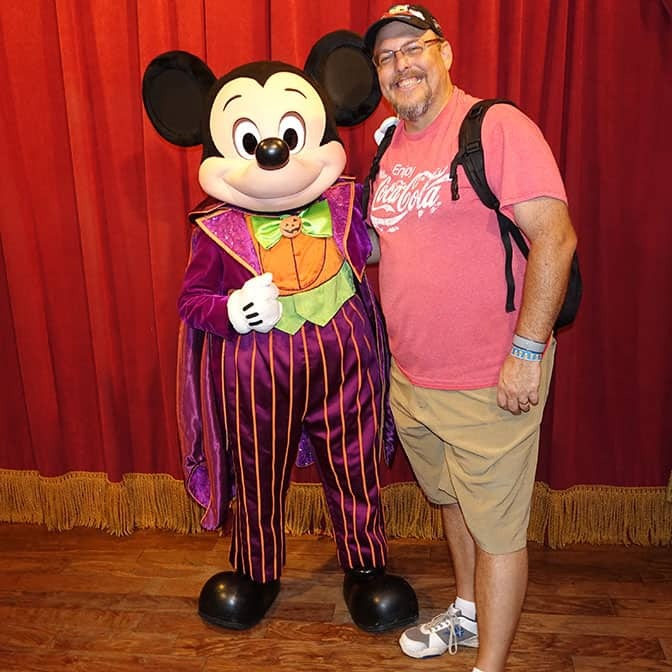 I think Mickey’s camera came out a little dark, huh? When I arrived Terk was out. Shortly before it was my turn she left for a moment to grab some bananas. I was fortunate that she had returned in time for the meet. The family in front of me met them all as well. This is always a fun meet as you have 3 different personalities in one meet. In all I was able to meet 34 characters in 15 queues in a single night. Again, on this night I had no intention of watching the parade, shows or fireworks. The plan on Character Locator is just for those who want to try to meet them as well. We went this year. 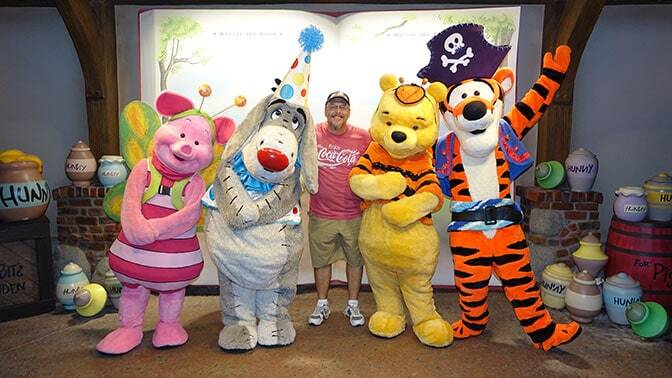 Got to meet Tarzan Group, Jafar, Lotso, Briar Rabbit, and Merida. 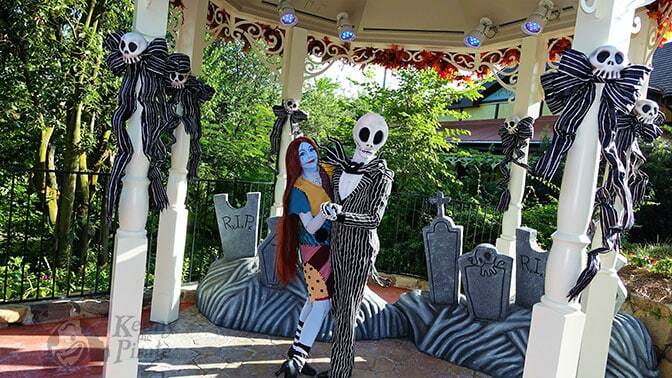 Another in our party met Jack and Sally. I think you are missing some. I believe Moana and Elvis Stitch are there also. As for the Dwarfs, would have loved to meet them but ran out of time. 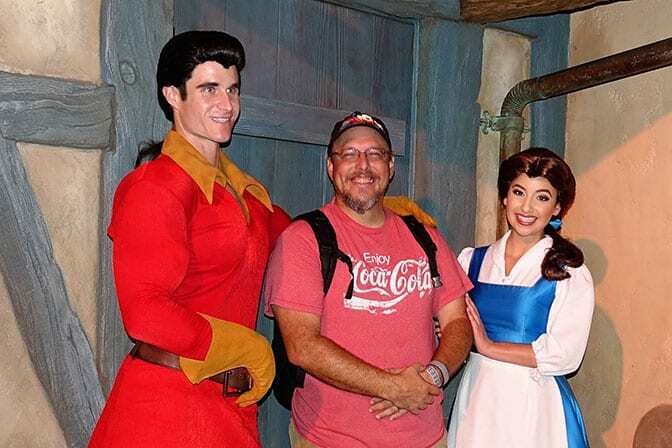 I see your point as a regular, but meeting the Dwarfs would have been cool and it’s not like we go every year. Probably our only time going. You claim that Cruella was pretty nice, but if you really want to have some fun, say something like, “Why would you steal puppies!? You should know better.” This works best on characters without masks. Hi Kenny, how late does Capt. Jack meet at the party? Character Locator is correct. Feel free to use chat on there for questions as well. Thank you! Didn’t even know there was a chat on there! 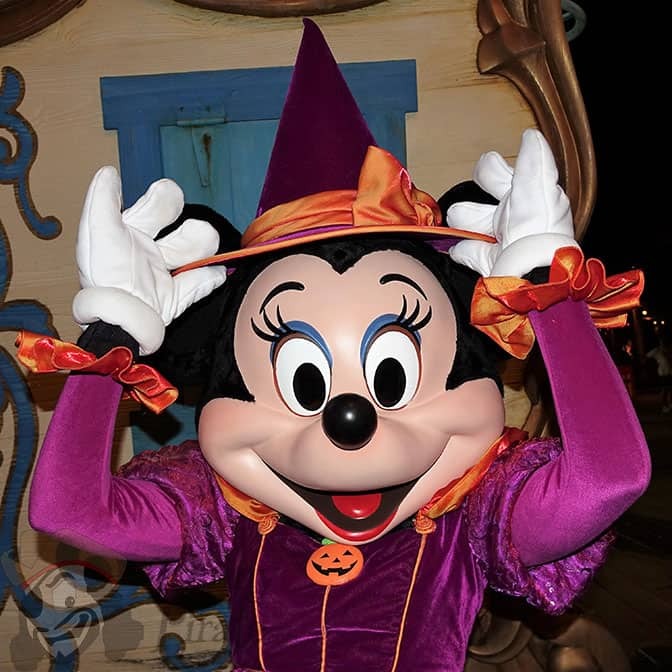 I know you said Mickey changes into his Halloween outfit right at 7pm, but I know fast passes end at 7pm. 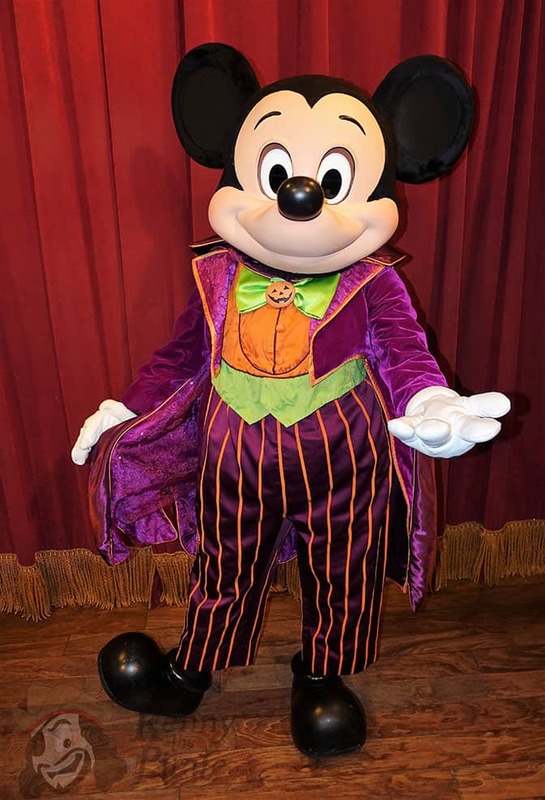 Do you think if I got in the fast pass line at like 6:55pm with a party band, that I would get to see him in his Halloween tux, or would he meet the last few in the regular line before he changes? (I hope this question makes sense!) Thanks!! Fp ends 6:30pm. and anyone that enters before 7pm will meet regular Mickey. Anyone after 7pm must have party wristbands. Ok, thanks so much for the info!!! They usually give it to you as you enter the line. 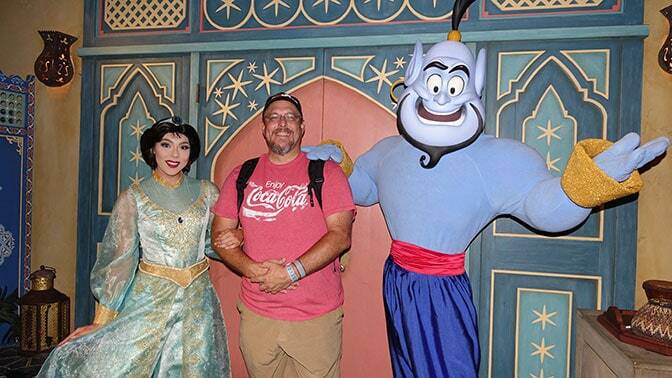 I ran late and got to Aladdin just after 7:00, and Abu was not there. The attendant said he wouldn’t be out until 8:00. 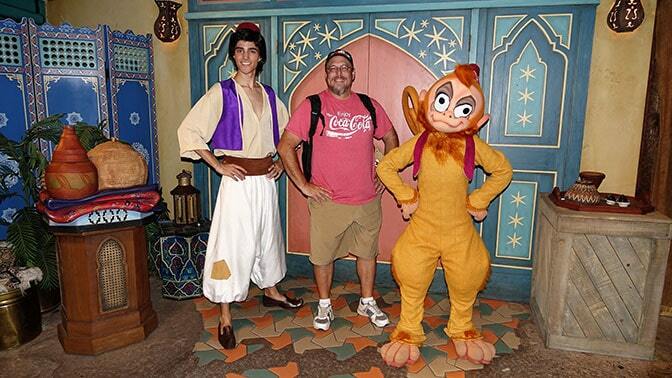 So I left and came back at 7:15, and Abu had joined Aladdin, but the line was cut. 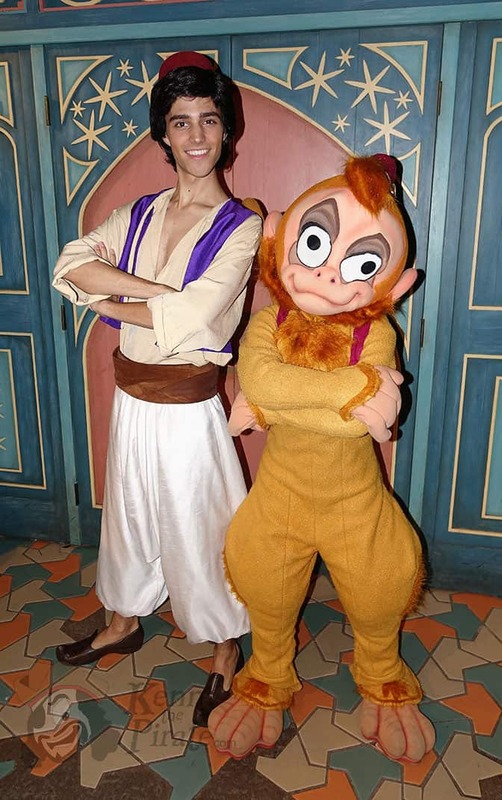 I had previously asked a merchandise Cast Member to call the character hotline to verify Abu’s meet time. He must have just been running late from picking bananas. My advice: if you know a character is supposed to be coming but is not there yet, queue up anyway, and let others go in front of you until the character arrives. I love character locator! I know you usually recommend a Sunday party but Sunday 10/2 is priced higher than Thursday 9/29. Should I do thursday. I went to first party last year and that was such a disaster. Glad I could help and wish you would have said hi! 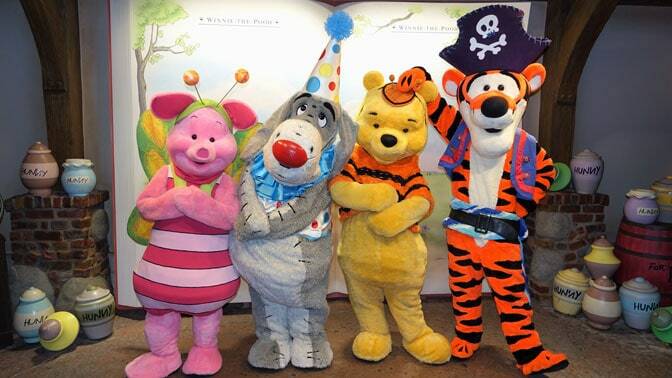 So if you are at the park on a party day but don’t have a ticket, can you meet any special characters between 4 and 7? Ahh Kenny, you do so very much for us and still keep a wonderous sense of wonder and joy about you. Thank you so much. 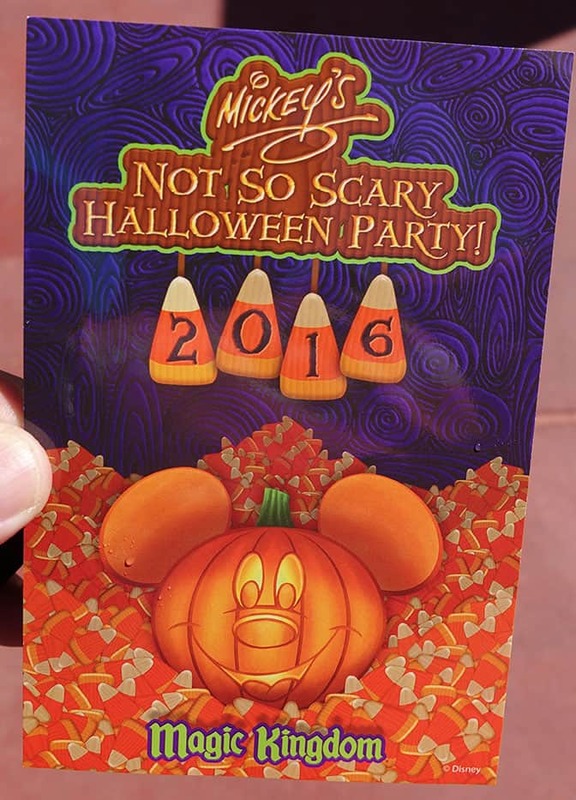 I have been to 4 or 5 MNSSHP now, and as it is Disney you know that the lines mostly move faster than the shown times. I know the line for the Dwarves fills up fast and can seem to take forever, it does move at a decent clip. I don’t know about the signature cards. Those must be new either this year but this would be the perfect place to have one. I have never been there right as the dwarves arrive. I think that the longest we waited was last year and we were in line for about 45minutes. Which was hard on the 5yr old (She was down there to celebrate her 5th birthday. She turned 5 the next day) but there was so many people to talk to and said she was lovely dressed as Tinkerbell, that she didn’t notice. Thanks again, Kenny, If you do grow out the goatee… just remember the grey is making you look more distinguished not old. Thanks very kind of you! I’m just a big, yet responsible, kid. The line early in the party for Dwarfs was easily 2 hours, but died down to about 30 minutes late. Last year I tried meeting them late at a busier party, but they closed the line with over an hour to spare. It’s so random. “Distinguished” I like that. I cannot believe you made it through all the characters! Such a fun follow up story. I think Jasmine kind of looks like a better “Mulan” (or is it me?) 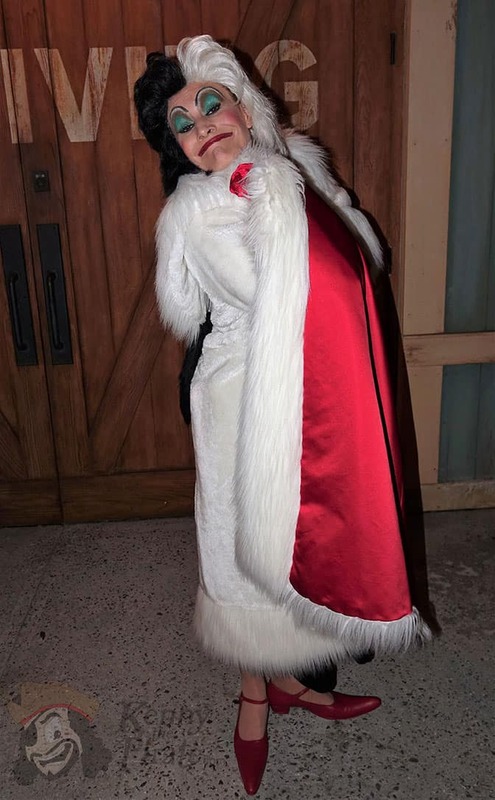 Also, I love your idea of taking out the dwarfs, reserve them for the Christmas party, and have 7 more villains! That would be amazing! I think that idea is so fantastic. 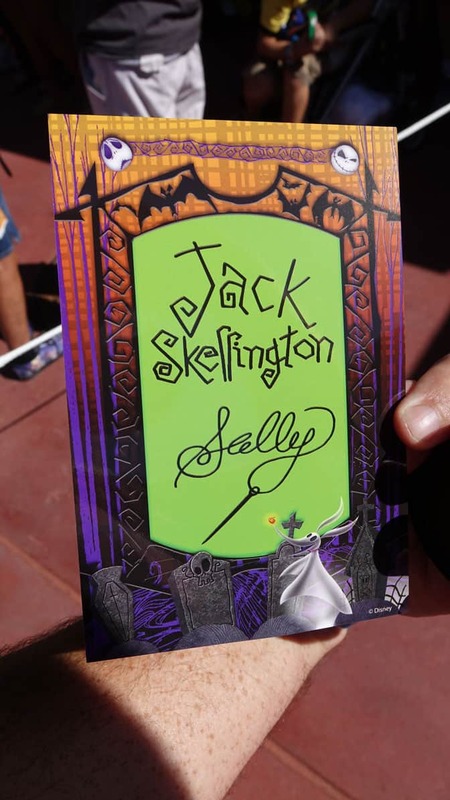 It would give me seven villainous reasons to attend another MNSSHP. And make the MVMCP an absolute must! We were there Sunday also! We were first in line for the Queen of Hearts and Tweedles but they did not come out at first with her which was a little frustrating. 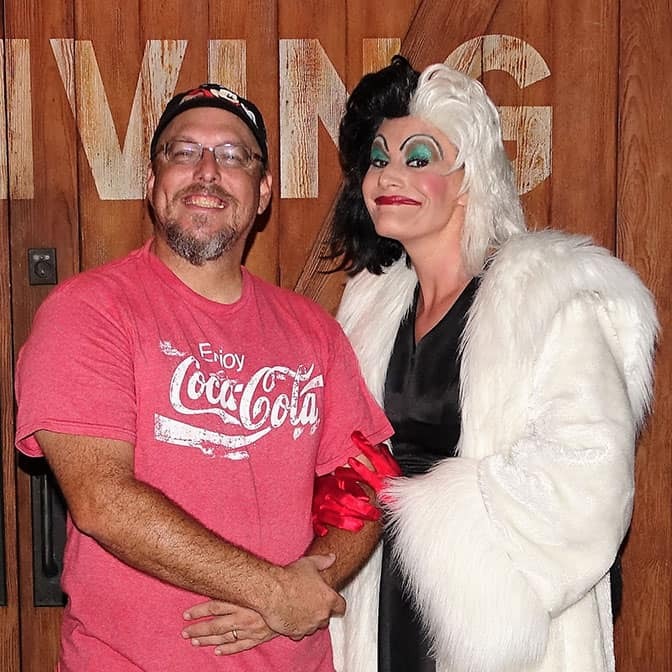 Cruella was awesome and I think she was our favorite. I had one report saying Queen wasn’t there and one that said she was. I had to ask the CM and he explained that she was trying hard to finish that croquet match. You mentioned they are not handing out trick or treat bags at the entrance any more. 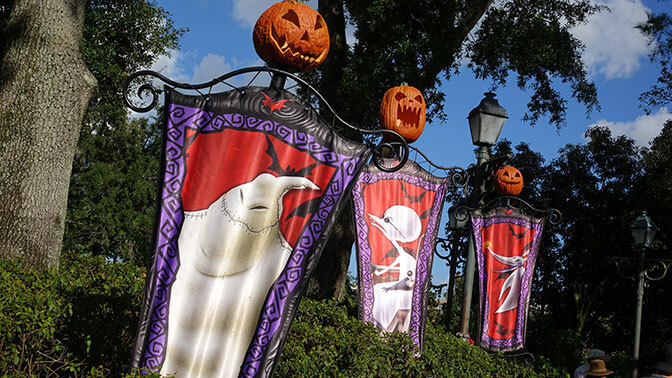 Do you need those bags to trick or treat or can you pick them up earlier at your resort. I am going with 2 little ones this year and want to hit the ground running on the trick or treating part since that is what they are most excited about. Actually, I also was there on the 11th . They did not do a very good job at directing party people who were coming into the park. If you stayed to the right, party people were being directed to the by-pass behind the Confectionary, where we received the treat bags and a pre-packaged Ziploc bag of treats. They also had the teal allergies bags and tokens. Hi Kenny! As always I love your work and appreciate it deeply! 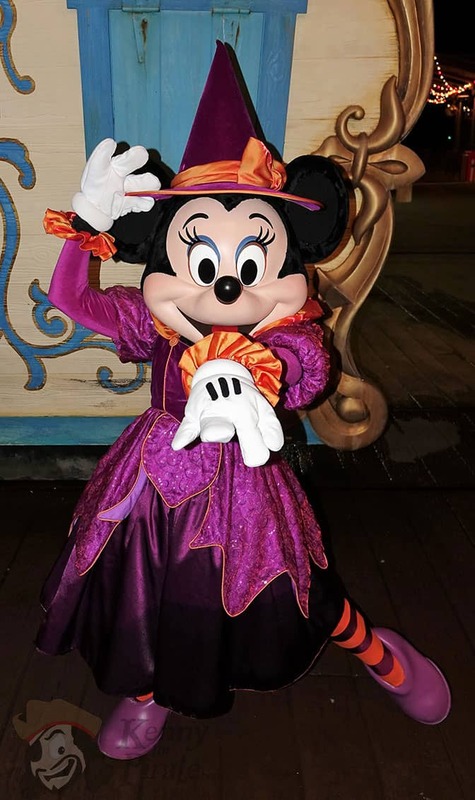 Will you be attending the Halloween Party in Disneyland and Shari g the inside scoop with us too? I will be going to DL next week. Hi Kenny-I have Character Locator and was trying to figure out a plan for our first party. The 7 Dwarfs are a priority. I know you state to line up by 5:30-6pm, and that seems to be consensus from a lot of people too. Is this still the case since they are coming out earlier this year? 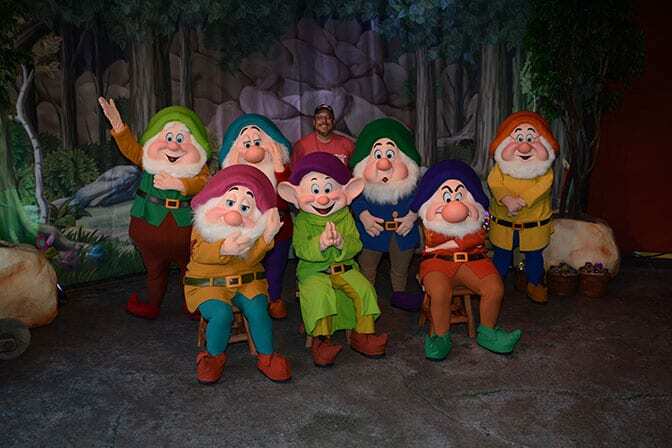 But, I have also recently read reports of only 30 min waits for the Dwarfs right after the fireworks. Which would be best? Thanks! 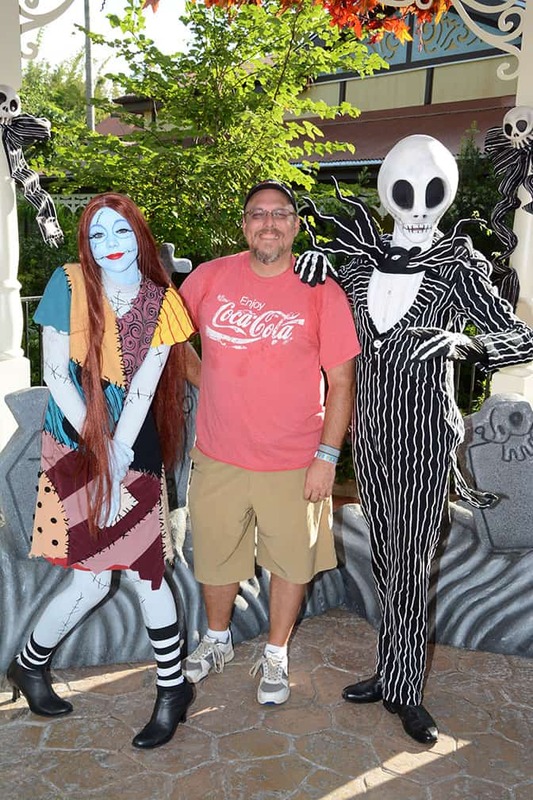 We are going to mnsshp on Oct 4th, with 2 young kids we are only planning to meet a couple of characters. Can you list on character located which ones hand out the cards as my daughter would love one. I am planning to use your touring plan focusing on parades, fireworks etc. Thanks for all your advice I believe this trip is going to be much better than the last since I have found character locator. 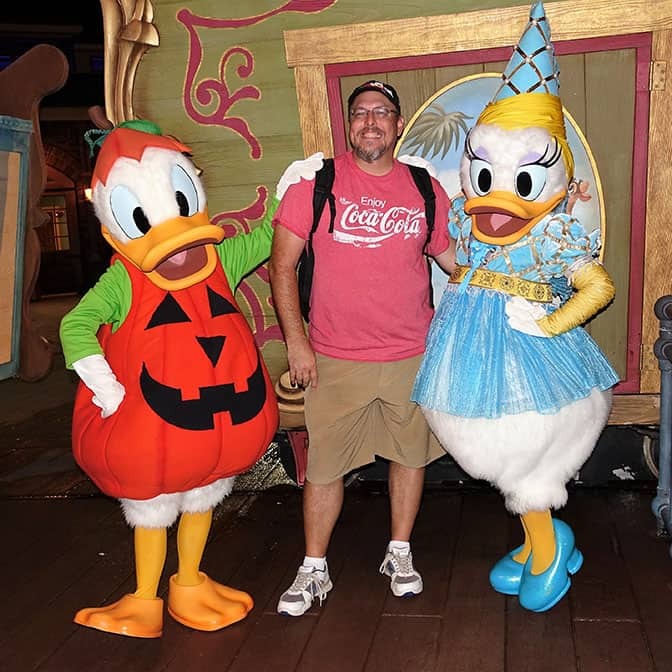 Kenny, I logged into Character Locator but the Extreme Halloween touring plan only shows you meeting 20 characters starting around 7:30pm. It doesn’t include Jack & Sally or the 7 dwarfs. Am I missing something? Odd. Can you email me a screenshot?